Destroy all creatures in a lane. 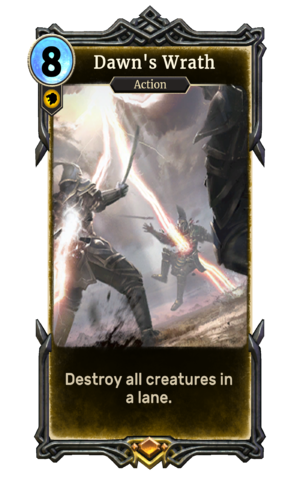 Dawn's Wrath is a legendary Willpower action card. It is part of the Core Set. Dawn's Wrath is named after the skill line of the same name in ESO. Its name and art were changed from "Flame Tempest" prior to the Open Beta. Using this card counts towards the Creatures Burned statistic. This page was last modified on 24 September 2018, at 22:36.